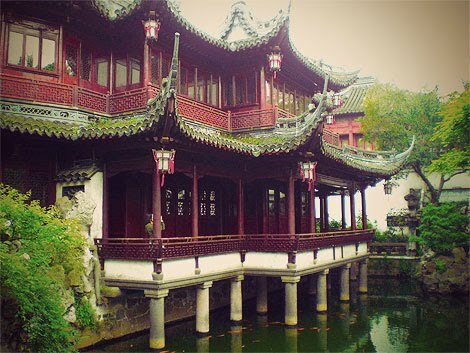 Yuyuan is a 400 year old classical Chinese garden in the Old Town of Shanghai, China. Pan Yunduan spent twenty years and all his savings building it to please his parents in their old age. I had the opportunity to visit the beautiful architecture and design of Yuyuan Garden in 2006. In going through some of my old books and magazines I came across an October 1942 issue of Modern Romances. I remember as a girl looking at this magazine at my grandpa's house. Now rediscovering the issue decades later it is interesting to look at these from a graphic design point of view. In the stories and graphics there is definitely a sense of glamour to the war and the expectation for women to stay strong for her man. The titles are beautifully hand-drawn with the body text manually kerned. The ads commonly use 4 or more typefaces - one script, bold, italic, all uppercase, and underlined all in one ad. THE MAN IN YOUR LIFE has gone to war. You miss him–and want him to know it. Then write to him. You love him–he needs to know it. Then tell him. Your heart's with him wherever he is. Then send it to him in your letters. Remember that letters can bind with "hoops of steel," so learn how to cast them. First, make a vow to yourself that you'll write at least once a week. Then let nothing make you break that vow. Tell yourself, "It's a date." Then keep it. He'll like knowing he can depend on that weekly letter from you. He'll be proud of your never failing him. The regularity and quality of your letters can save him from homesickness, discontent, restlessness. That's your responsibility. Shoulder it like a flag! Be natural, sincere, but always cheerful, in your letters. Write just as if you were talking to him. The written word can carry you to him as truly as your own voice over the telephone if you write like you talk. 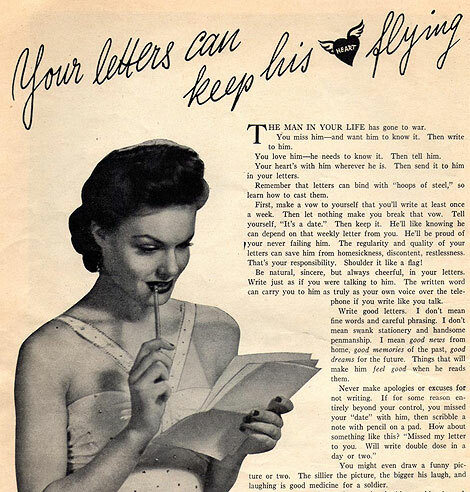 Write a good letter. I don't mean fine words and careful phrasing. I don't mean swank stationery and handsome penmanship. I mean good news from home, good memories of the past, for the future. Things that will make him feel good when he reads them. Over the weekend I visited a local exhibit of school art. 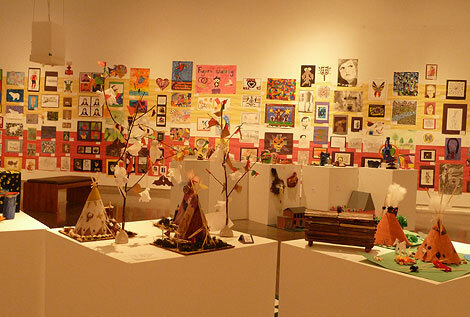 The children who had artwork displayed ranged from Kindergarten to Grade 12. In a refreshing way this exhibit inspired me to see the personal expression that progresses during a child school years. In another way it also reinforced what society's definition is of what being a good artist is. As I walked through the exhibit from the youngest artists to the oldest you could see a transition from free style scribbling and writing in painting, drawing to photo-realistic renderings. The artwork from the older students lacked the naivety and the spontaneity that was captured from the young artists. Translated on a larger scale are society and our education system teaching us to lose our creativity? We stigmatize mistakes. Kids will take a chance and are not frightened with being wrong. If you are not prepared to be wrong you will not be able to be innovative. This means we are losing our creativity. Sir Ken Robinson makes an entertaining and profoundly moving case for creating an education system that nurtures (rather than undermines) creativity. Take a look. Art Installation At Bar 89 In New York. The restaurant has the best gourmet burgers ever. In my gathering of photos for my family's 100 year anniversary I have gained a new appreciation for vintage photography as a lost art. In the today's age of instant photography the imperfections, the shadows, the tiniest details are what makes vintage photography so charming. To see images of your grandparents or parents as children from a different time makes me feel like I'm traveling in time. And then there are photos such as the one above where all the people are complete strangers to me. I do not know the story of what is going on but that makes it even more interesting. I feel compelled to rescue this image and imagine the story. 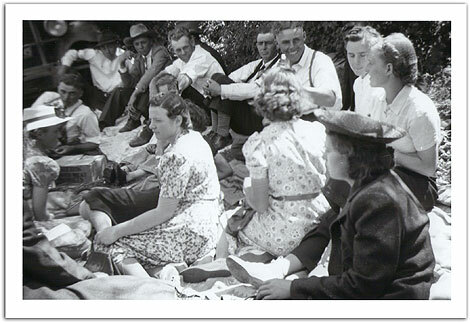 Is this a community picnic? Are these men and women single as the men and women are clearly sitting in groups? Are they brothers and sisters or good family friends? The man with the huge smile - is he flirting with the woman to the very right? The other ladies do not seem as interested in the conversation. 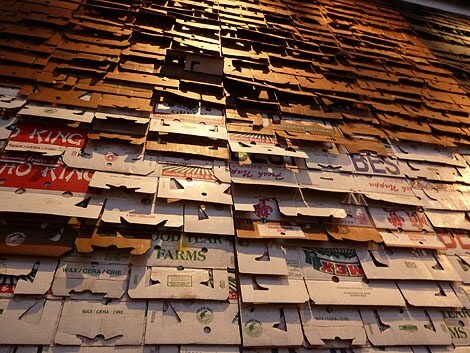 There is a cardboard box stamped with "meat" and to the top left a vehicle with a headlight. It's hard to believe people would part with these type of memories. I was in an antique store recently where there was a tiny 1920's photo of a couple in love for sale. Who would want to forget that story all documented in one image - his arms around her waist in front of a Model Ford truck? With the age of Flickr, collectors are sharing their lost photo finds and connecting with others with the same passion. There are thousands of photographs with unclaimed owners each with a story of a different era. They are artifacts of unknown men and women, their lives important and interesting. The images are authentic and honest and tiny works of art.